19th - 23rd August - Banks of the River Ure - All Welcome! Since being founded in December 2005, Song-of-the-Paddle has become a wonderfully vibrant home to open canoeists from throughout the UK and beyond... and each year's "Big Meet" allows all associated (and anyone interested) to gather for a sociable weekend of camping and a bit of independent / peer-group boating. 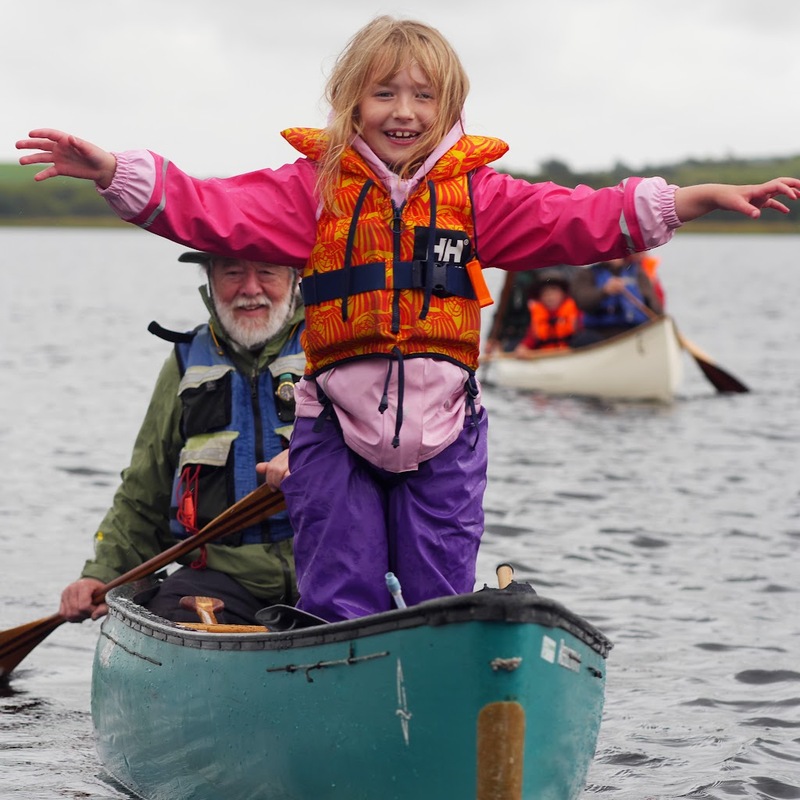 This year's gathering will be hosted by the Yorkshire Regional Development Team of British Canoeing on their land on the banks of the River Ure in Ripon (on the eastern edge of the Yorkshire Dales). A water bowser - not labelled "drinking water" but filled from the mains! All boating will be on an independent / peer-group basis but a coach familiar with the region will be available on Saturday 20th August to advise on boating options (adjacent to the site and further afield). Manufacturers and Retailers will be attending for the Playday which is also expected to include some mass-participation canoe polo. Throughout the Playday we hope to have the Sprint finals from Rio showing on a big screen: to be confirmed. 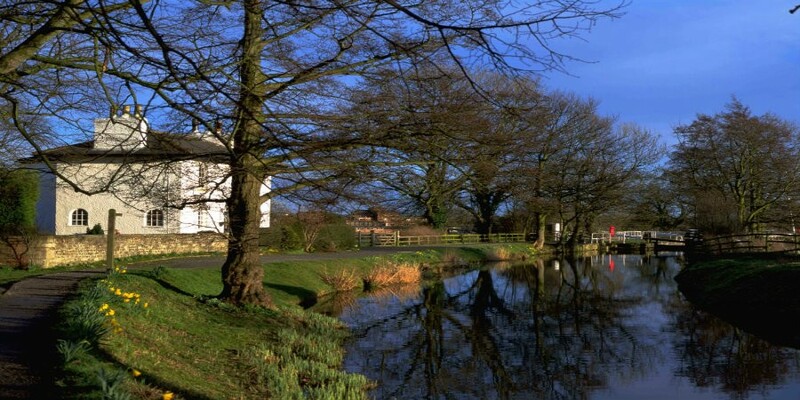 Note: we also anticipate an simple touring trip into Ripon - down the canal and back on the river. A shuttle vehicle and trailer will be available for the final (very short) portage. See also the SotP Blog A three river trip in Yorkshire and the Canal and River Trust's map of the River Ouse. Please note: the Wharf and Swale are also within easy striking distance for day trips! The Washburn is England's Premier Dam Release River​... and on Sunday 21st we'll be hosting Playboating, Boater-X, National Championship Racing, a BBQ and a Party. Everyone attending the "Big Meet" is invited... and Event Tickets cover participation in the Boater-X! Equally, some may not have explored the loop into Ripon on the Saturday... and much else is available. We have local veterans to advise! Ripon to Linton is a classic touring route. The majority of the descent is on navigable waterways. The campground at Linton is charming, and is expected to become very popular in the near future as the adjacent weir is being developed in 2017 to provide an all new canoe course. This may be a last chance to see what's being replaced! A shuttle will be available for anyone preferring to day trip and then return to Ripon, and again, other options will be discussed nearer the time. If you'd rather disappear off to the Dales or the North York Moors we'd understand. If the weather suits, we might even recommend a jaunt at Flamborough. If we've had rain, the Wharf and Swale are on the doorstep and the Tees is only just up the A1 - but if you want another gentle touring day, York is a good option! As ever, what transpires will follow the interests of those attending. We've plenty of time to make plans for later in the week, but Big Meet participants would be welcome to stay on at the campground for a small additional fee. Equally, if anyone's interested we can easily arrange a canoe camp on the Yorkshire Derwent, a trip through Leeds or perhaps a potter on the Pocklington Canal. Lots of options! Beyond those options, we know of many other good campgrounds in the region - let us know what you seek! British Canoeing in Yorkshire and Humberside is volunteer-run and encompasses everyone from the independent boaters to the volunteers in clubs and uniform groups, and from manufacturers and distributors to retailers and coaches who work in the industry. Booking now open c/o Eventbrite - Click to Visit! Last edited by GregandGinaS; 22nd-July-2016 at 10:37 AM. We've tried to keep booking as simple as possible... and in order to minimise the "cut" taken by Eventbrite we've favoured all-inclusive deals. We're pricing to include 1, 2-3 or 4-5 people for a whole weekend, or for longer. OCA Membership would qualify and is £15 / year (adults) or £25 / year (families). We can also offer temporary membership of Pennine Canoe and Rowing Club at £8 / adult or £5 / junior. Fundamentally, we're not aiming to make money from the event: we just need to cover costs like preparing the site and bringing in facilities. Any surplus from the weekend will be re-invested in canoeing in the Yorkshire and Humber region. SotP will be consulted about how! Weekend only - Covers 2-3 family members camping @ Ripon for a maximum of 2 nights plus Event Ticket (insurance) and Boater-X Entry to Washburn Boaterfest 2016 (if you park at the Woodyard; shuttle available). Discounted Ticket for British Canoeing members and member of a formally-attending affiliated club (e.g. Open Canoe Association) - as your Membership saves US a total of £5 / head! Covers 2-3 family members camping @ Ripon for a maximum of 2 nights plus Event Ticket (insurance) and Boater-X Entry to Washburn Boaterfest 2016 (if you park at the Woodyard; shuttle available). Covers up to 2 adults and 3 youngster camping @ Ripon for up to 4 nights plus Event Ticket (insurance) and Boater-X Entry to Washburn Boaterfest 2016 (if you park at the Woodyard; shuttle available). 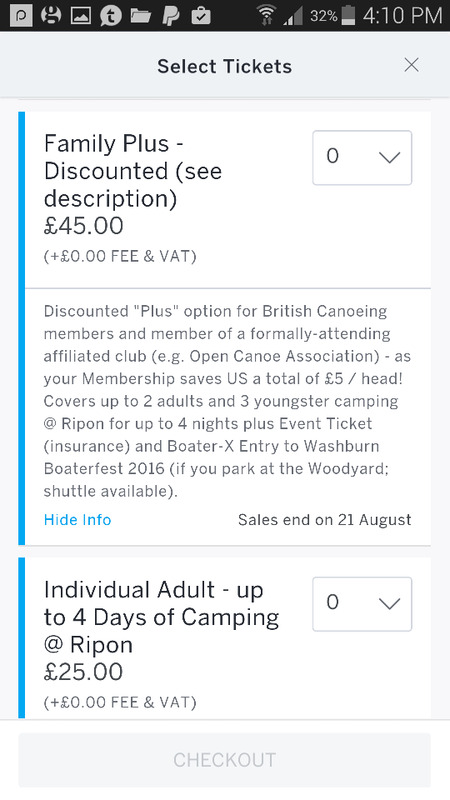 Discounted "Plus" option for British Canoeing members and member of a formally-attending affiliated club (e.g. Open Canoe Association) - as your Membership saves US a total of £5 / head! Covers up to 2 adults and 3 youngster camping @ Ripon for up to 4 nights plus Event Ticket (insurance) and Boater-X Entry to Washburn Boaterfest 2016 (if you park at the Woodyard; shuttle available). Covers camping @ Ripon for up to 4 nights plus Event Ticket (insurance) and Boater-X Entry to Washburn Boaterfest 2016 (if you park at the Woodyard; shuttle available). Discounted for British Canoeing members and member of a formally-attending affiliated club (e.g. Open Canoe Association) - as your Membership saves US a total of £5 / head! Covers camping @ Ripon for up to 4 nights plus Event Ticket (insurance) and Boater-X Entry to Washburn Boaterfest 2016 (if you park at the Woodyard; shuttle available). For anyone wanting a very brief "Big Camp" - a basic contribution to the running costs of the event. Includes an Event Ticket (insurance) for the weekend and Boater-X Entry to Washburn Boaterfest 2016 (if you park at the Woodyard; shuttle available). If you've specific requirements not met by any of the above please get in touch! Last edited by GregandGinaS; 22nd-July-2016 at 11:30 AM. I'm sorry I'm going to be missing this. I hope you all have a super time. Looks good. I've made the thread a sticky till after the event. As I said in the discussion thread due to Jo's Chemo we can't camp and she probably can't paddle but we are looking into dog friendly accommodation locally to see if we can attend for a couple of days. It'll be a shame if we can't make it as it looks like it has something for everyone. Wow, you have put a huge amount of planning into this, really hope enough people are still planning on going! I had planned not to go boating that weekend (want to dry and pack my gear for the grand canyon), but with so much planned for the Washburn on the Sunday my plan is changing, and to be honest it is the combining with the National WWR event that tipped the balance, so my question is, does the BoaterX/Boaterfest entry also cover WWR entry or will I pay that separately to the WWR people on the day? I will no doubt be sprinting in K1 and OC1, but have yet to choose my boat for the classic race (probably the K1). Now to work out if I need the individual or the flying visit.... I probably should drive down Friday and have a relaxed Saturday in the Apache, if I ever get gunwales sorted. Sounds really good, genuinely sorry I'm in Sweden at that time. Lots of differing opportunities from gentle paddles to whitewater on offer, and the cost for a whole/long weekend is good value when compared to the Bala campsites. Thanks for organising Greg. Looks great. I doubt there are enough days to cover everything mentioned. I hope to be there. Looks great. I doubt there are enough days to cover everything mentioned. ...so I suspect folk will be here, there and everywhere doing whatever takes their fancy! Yes, we'll have plenty going on "on site" at Ripon on the Saturday... and then at The Washburn on the Sunday... but I don't doubt subsequent blogs will have feedback from all over the place!!! - Do members of the SCA or CW get the discount too? - There's a two night family ticket but not a two night individual ticket? - The individual adult ticket description says 'maximum 3 nights' on one line, but 'up to 4 nights' on the next? Tickets are very much "up to" a certain number of days. The cost of two nights wouldn't be much different from the cost of 3-4 nights so I kept things simple! The mention of three nights is a typo: will sort ASAP! Keep the questions coming as I'm sure there's more I could clarify or need to sort! Thanks for the explanations, Greg. "Tickets are very much "up to" a certain number of days. The cost of two nights wouldn't be much different from the cost of 3-4 nights so I kept things simple!" ... so drop number of days entirely? ... trying to figure costing for 2x BCU Affiliated club members for Fri night/Sat/Sun ... poss Mon. Clarification - our costs don't escalate much for folk like you who are members of an affiliated club... but they go bananas with families who are not! Can I check this is the ticket I would be eligible for. I have individual BCU membership and individual membership of White Rose canoe club in Leeds but nobody else in the family has membership will be applying to come with 2 adults and 2 children age 5 and 3. Alternatively if not camping could I drive up for the day to paddle? so we need to be members of a club and the BCU to come to this? As organiser, I save £5 per head for everyone who can show some sort of affiliation... but EVERYONE'S WELCOME! This is an issue I'd already identified and I've raised it with Head Office. Tick the discounted option: I'll deal with the haggling over how much I have to pass on to Nottingham! And from what you're saying - it's ok to be a member of an affiliated club, you don't need to be an individual BCU member. OK - no-one needs to be a member of anything to attend the "Big Meet" - and as with any year, we're kinda expecting most folk will just book a "camping" spot and do their own thing. Costs, even at "full" rate are minimal - less than most Yorkshire campgrounds. For starters, we've a £12.50 option. We anticipate £5 going to insurance, and are including access to the Boater-X in that fee! £25 For one adult for up to four nights of camping, etc. £40 for up to three in a family for up to two nights camping, etc. £55 for up to five in a family for up to four nights camping, etc. At the moment, the only options to get that are membership of British Canoeing (which has other advantages) or membership of an affiliated Club / Association (e.g. the OCA). Ps. It's possible that by the time of the event we will even have sorted an option to keep the funds in Yorkshire rather than losing them... but that's another story! As I've always been a bit think when it comes to matters financial, I'm finding this all a bit difficult to get my head around! So we don't have to be a member of anything, but have to pay £5 extra if we're not? That extra £5 is for insurance? What insurance is it? Why is it necessary/obligatory? Who are 'the many' and how can they save 'us' costs? Who is 'us'? What constitutes 'the funds'? Do the fees we pay to attend not go fully and directly to the owners of the campsite? Who are 'the many' and how can they save 'us' costs? Who is 'us'? [...] What constitutes 'the funds'? Do the fees we pay to attend not go fully and directly to the owners of the campsite? The "us" is a network of volunteers who work to promote canoeing in Yorkshire: representatives from different groups and clubs plus other enthusiasts who between them run everything from the canoeing that took place at the recent Leeds Waterfront Festival (where hundreds tried canoeing and assorted teams had a canoe polo tournament in the middle of Leeds DocK) through to the folk who are looking after youngsters in the alps and who'll be running a ten day training camp in Scotland almost as soon as they get back. The "us" are the folk who manage "The Washburn" so that Yorkshire Water will release huge volumes of water down a tiny ditch to facilitate year-round canoeing. It's the folk who look after the land at Ripon so that canoeists have somewhere to launch / land and to wild camp, and so we have a voice in any discussions between local riparian owners - and it's the folk who are working with assorted partners to ensure what when the UKs largest Archimedean screw turbine and new fish pass are installed at Linton Lock, we also get a great venue for canoeists. The insurance is because all of this volunteer effort would stop overnight if we believed volunteering our services could leave us exposed to losing our homes and everything else in the event of a screw-up and the way to keep the funds in Yorkshire (supporting this network of volunteers) is to set up an inexpensive "membership" association which means we get our insurance for rather less than is currently available. Ps. We own the campsite, but our insurance (to host others) only covers us for folk who are themselves insured. Many thanks for the attempt to explain it to me, Greg. I'm now resigned to the fact that I'll probably never understand what it's all about! Bottom line - it doesn't really matter what's going on behind the scenes! Key thing is we all turn up, enjoy each others company, do our own thing and go away reckoning it was a good meet! I tried to contact the booking agents to ascertain whether a small caravan would be permissible on the field. That was 3 days ago and no reply. So... Is a caravan permitted in lieu of a tent? My (financial) self-esteem has been restored somewhat by the fact that my wife, an accountant of many years experience, has just read through it all, and she doesn't understand it either! The good news is that as landowners we can allow camping (tents) for up to 28 days in a year. The less good news is that caravans appears to be a whole other ball game... and comes under the Caravan Sites and Control of Development Act 1960. Source: here. Bottom line: unless we can get some sort of exemption, caravans would have to go to the nearby caravan site: Riverside Meadows. Ps. If someone can come up with a way around this then let me know! Do you want us to take a spare tent? Following some discussions today, it's looking promising for everyone to be able to take the discounted option! Thanks, but no thanks. I've tents enough. But I will have just finished leading a 17 day Coast to Coast walk nd I really don't fancy the idea of camping the day after I get back. Is this a "Song Of The Paddle" "big meet" or a pre-existing club event to which sotp members are being "allowed" to attend? it's not just the pricing that's a bit confusing. Just arrived in Mallaig for the Knoydart meet. Will update the Eventbrite page asap. just booked for the big meet for Friday and Saturday night. first time at any SOTP social or meet up. really looking forward to meeting up with some of you. Hi Greg - great to meet you and the clan in Knoydart. Did mention about the Big Meet, but just found out I'm on petsitting duties that week. So - confirming my non-attendance. Basic 2-persons (plus presumably optional kiddie) still showing as "for a maximum of 2 nights" on Eventbrite. Everything else shows as up to 4 nights. Is this an error ... will it be corrected ... if we get an up to 2 night permit can we stay 3 nights? caravans appears to be a whole other ball game... and comes under the Caravan Sites and Control of Development Act 1960. Source: here. An apology is sometimes easier than permission refused. I am guessing that if you park a caravan for a weekend, the local authority will complain at you whereupon you apologise and promise not to repeat. Just don't make a habit of it. for the Ripon side of the weekend, discounted rates are open to absolutely everyone! Other changes: "Basic" option now covers up to 3 nights... "Plus" option now covers up to 5 nights... "Flying Visit" can now be had for £7.50! Discounted Ticket Covers ANY GROUP OF 2-3 FAMILY MEMBERS camping @ Ripon for a maximum of 3 nights. Ticket ALSO covers Boater-X entry for those who have insurance through British Canoeing membership / membership of a formally-attending affiliated club (e.g. Open Canoe Association). Covers up to 2 adults and 3 youngsters camping @ Ripon for up to 5 nights plus Event Ticket (insurance) and Boater-X Entry to Washburn Boaterfest 2016 (if you park at the Woodyard; shuttle available). 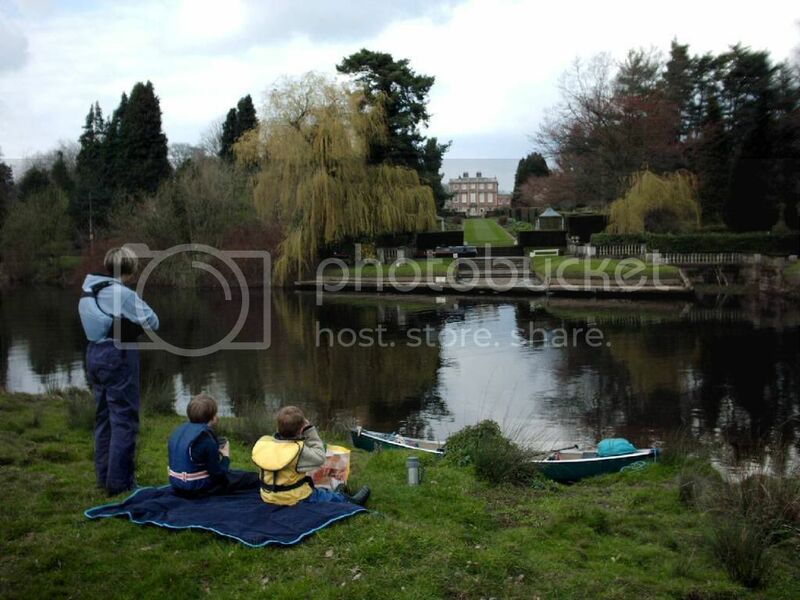 Discounted "Plus" option - covers up to 2 adults and 3 youngsters camping @ Ripon for up to 5 nights. Covers camping @ Ripon for up to 5 nights plus Event Ticket (insurance) and Boater-X Entry to Washburn Boaterfest 2016 (if you park at the Woodyard; shuttle available). Discounted - covers ANY individual camping @ Ripon for up to 5 nights. Ticket ALSO covers Boater-X entry for those who have insurance through British Canoeing membership / membership of a formally-attending affiliated club (e.g. Open Canoe Association. For anyone wanting a very brief "Big Camp" - a basic contribution to the running costs of the event. I'm booked in ... a note for the (likewise) terminally befuddled ... the Eventbright booking system requires credit/debit card info, not PayPal, it also gives you only 8 minutes to in tap your details before ejecting you from the booking system to allow younger and more computer savvy paddlers to nip in quick and pinch your spot. Having everything now to hand the second attempt was a doddle. 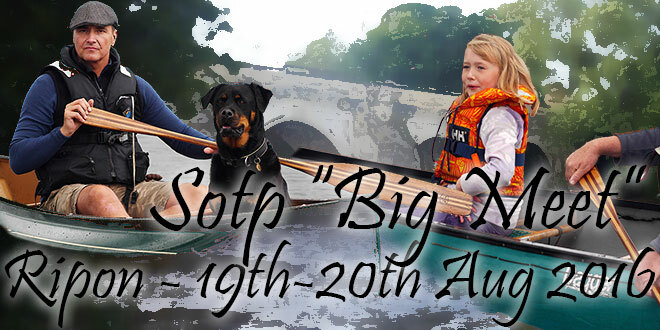 We are hoping to come to this and meet up with fellow SOTP paddlers, but are only free from Friday lunchtime till Saturday afternoon....what time can we arrive on Friday please, and is there a programme of things happening on the Friday? We have to depart by about 2pm on the Saturday, so am also wondering if we would not really be able to participate in the Sat activities unless there's stuff happening in the morning? Would we need more than a "flying visit" ticket each? All advice gratefully received. The "Big Meet" is basically folk getting together for a great weekend with one another... but the site at Ripon is there all year round. Folk can arrive this weekend if they like... though water and toilets will not be arriving until next week! We're likely to be on site from Thursday evening. The "programme" is generally what folk make up as they go along... but if we've got people on site you can guarantee something will be happening! On the Friday, I could do a shuttle if folk wanted it, and if the rivers are up that could perhaps be on the Wharf / Swale. Let's see who's interested in doing what! We have to depart by about 2pm on the Saturday [..] Would we need more than a "flying visit" ticket each? All I'm looking for is a bit of a contribution from all concerned to cover our costs in setting up the site: grass cutting, toilets and so on. For what you want, a "Flying Visit" ticket would appear a fair contribution. If you end up feeling you should have contributed more, I'm sure we'll have someone taking contributions on site! Wow, I can see a lot of people are really confused. I can't explain the price structure but maybe some of the rest? The big meet in Ripon will be a typical SOTP event, but instead of using a commercial campsite, it will be on a piece of land owned by BC Yorkshire region. Greg who is organising things, is part of OCA and BC Yorkshire region, hence having the knowledge to get the site, but it means he wears many hats which is going to confuse people! In order to have people camping on BC land, they need to be covered by the BC insurance - this insurance has multiple angles which people don't always realise. There is a third party element which means if the individual causes an accident and gets sued they are covered, but it also includes and element where the people organising stuff on behalf of BC (and this is on their behalf because it is their land) are also covered in case a participant suffers some kind of injury that could be inferred the responsibility of the organising team, something like perhaps slipping on a patch of mud and breaking an ankle - something quite feasible on any campsite in a typical British summer. The normal way to get BC insurance is to be a member of BC (Or is it Canoe England? ), SCA, WCA or CANI. There is also a clause written into BC's main policy for event cover (which is what is needed for camping) which covers them for a member of an affiliated club, so if you have joined a club which is affiliated to BC,SCA, WCA or CANI, you don't need to be a full member of any of the associations in order for the organisers to be covered. Whether you have personal 3rd party liability cover I am unsure, but the organisers have it for their liability to you. If you are not in either an affiliated club or direct member of a national association, you can buy a BC day membership to provide the necessary insurance cover, this is what the £5 is/was for. Presumably Greg has now managed to get something negotiated with the BC insurers to allow people who aren't members of clubs or associations also covered by the BC insurance so they can camp on the field without having to buy day memberships, or perhaps he has found additionally funds to pay the day memberships without charging you - either way its a great result. If you don't want white water, there is no need to read any further - your weekend is all covered above. BC Yorkshire organise the Washburn releases and Greg chose the weekend such that SOTPers could also use the Washburn if they want to. The weekend was already down for the WWR National Championship, but the WWR community are really friendly and somehow Greg has negotiated to share the release with them and it seems a Washburn Boaterfest has spun off as a by-product, including a BoaterX race - your SOTP weekend booking includes entry to the Washburn boaterfest and BoaterX race if you want to have a go, BUT because that part is actually a paddling event organised directly by Yorkshire Region you will need to be a member of either an affiliated club, or national association to be able to take part - for this, a £5 day membership for just that day can be used. The Boaterfest includes time to just mess about on the top half of the river during the morning, plus a boaterX race in the afternoon for anyone who is interested - I know a lot of the SOTP fringe of OC1 paddlers are heading over especially for the BoaterX, it should be a good laugh watching us tripping each other up down the course, and we are hoping to get to laugh at some of the trad boaters doing the same. There should be quite a good gathering of OC1s and I'm sure all the guys will be happy to let people try them out. Robin Hood Watersports will also have some demos (canoes, kayaks and SOTs I think) available at the dam. The WWR national championship obviously needs to run to the normal WWR rules (full national association membership probably needed, I'll try to check) and the WWR committee need fees to cover prizes etc. so I think that would be at extra cost on the day. WWR is a time trial format unlike BoaterX which is head to head racing, many WWR paddlers have started taking an interest in BoaterX so it is expected there will be some cross-pollination with WWRers entering the BoaterX and Canoeists entering one or both of the WWR events (In the sprint event you get 2 timed runs over about 200m or river and your best time counts, in the Classic event you are timed over a full decent from the dam to the reservoir). Although you may be envisaging odd shaped WWR kayaks or C1s, absolutely any boat is welcome to enter WWR events, I have entered in the past in open canoe and an old general purpose kayak, although I do now have a WWR kayak which I will be using. The registration form lists lots of different types of boats, as long as a few boats enter the same class, they will be classified together and maybe even get some prizes - I would think if 5 trad boats entered as open canoes, the top 3 would get prizes or trophies and they would not be compared with the much faster WWR C1's. OC1s and trad boats might get classified together. BUT, if you are not into WW, you can go to the Big Meet and not have anything at all to do with the Washburn day and not have to be a member of a national association of an affiliated club - I expect most people will be taking this option? Greg - I apologise for not booking anything yet, as I mentioned on Friday I am still swithering about whether to slalom race at Fairnilee on the Tweed on Saturday and then on to camp at Ripon for Washburn Sunday, or just to go to Ripon Friday evening and chill out in my trad boat on the Saturday. As soon as I finish repairing the gunwales on my trad boat (snapped in another place getting ready to oil them before re-fitting - short term cut out the rot and plan to replace in future isn't going so well) I will experiment with what combinations of boats I can load up . What is the situation with licenses to paddle on English waters? I'm Scottish, and a member of an SCA Affiliated club, but not a member of anything else and have not bought any kind of license for English waters. Do I need to do anything to be able to paddle? Hi. A couple of us just want to come over for the day, not camping. Do we need to book? Excellent question - which I passed on to higher authorities earlier today! I will sort something out by the time you get here... but not sure what! Booking would be good as I can get a sense of numbers and (if necessary) order in additional facilities and water! A couple of "Flying Visit" tickets would give us a small contribution to our costs. If you turn up on the day we'll doubtless have someone taking a minor visitor's fee... but life's a lot easier with all the admin stuff done online! Many thanks Greg. I'll work out how many coming and do the "Flying Visit Tickets"
Currently planning to come up to join you for a day paddle on either Saturday Sunday or Monday. what flat water options are there likely to be for an open boat with kids on those days? As much as we would really like to come to this I just can't see it working out. It is just too soon after Jo's next chemo session for her to be up to traveling that far so it is better to say we can't make it now rather than saying last minute. On typical SOTP terms, shouldn't we start a who's going list? Does not feel a true meet otherwise! Options about for paddling on flatish water on ANY day, and several canoeists who know the area like the back of their hand have been giving me details of recommended options. Better still, most of them will be attending... and we should have 2-3 trailers on site to use with shuttles... so no matter who wants to do what (or what the water levels) options should be plentiful. One recommendation for the Saturday would be a trip down the river and back up the canal. This would finish just down the road... and with a trailer and my 8 seater on hand we should be able to get everyone back in a matter of minutes. Access here is between a simple bridge rapid and a shingle rapid leading below the A61 road bridge. Downstream leads to a simple riffle on the Bell Banks bend (1km downstream of A61) that is great for practicing moving water skills including poling, tracking and lining. Further flat/G1 water leads to Hewick Bridge that is best shot close to middle but can be shallow in low water and may damage fragile boats (wading and lining in entirely feasible). A nice fast shoot on the river right after Hewick bridge leads to a gradual slowing of the river and its transformation from a natural river into a managed Navigation. Options for egress are Westwick Lock or a return trip up the Ripon Canal. Access / Egress: numerous places in Ripon. Best either at the Lock Basin in Ripon (follow road signs for Canal Trips) or at the car park near Ripon Racecourse/Ripon Marina. Free parking at both. The canal gives around 4km of water ranging from Urban to picturesque and quiet. Two locks on the canal and a third where it joins the River Ure must be portaged rather than ‘locked’ due to the low water feed to the canal from the River Skel. Continuing past Oxclose Lock puts the paddler on to the River Ure with around 2 km of flat water to explore upstream before riffles impede progress and around 3km of flat water downstream to the cutting that leads to Westwick lock. Access: Westwick lock SE355 667 - Drive down the track/bridleway off the Boroughbridge road approx 3km east of Bishopmonkton. Limited parking (6 cars) and make sure to keep on hard stand if the ground is wet. 5km of flat water lead to Boroughbridge Roundabout SE 395 671 - Ample parking for 12+ vehicles that allow access on to the water via the Milby Cut. Is there any water for beginner WW paddlers to try? I've do a couple of grade 2 riffles but it would be nice to get a bit more under my belt especially with the experience of some of the paddlers attending. Being a gardener im sure i can stick a spade in the van to dig out a pit for a fire. Im still yet to confirm yet as work is hectic at the minute, it will be a late decision looking at my diary. Hi Ricogee, it's easy ... just copy the list on the previous post on the thread, paste it to your post and tag yourself on ... it's important that folks realise that tagging onto this list doesn't mean you are booked in, that has to be done via Eventbright as detailed above, but it does let our SOTP community know that you'll be there ... see you shortly ... Mike. I'm interested in going - was already going to the BoaterX day at the Washburn. But I have confused myself with the prices. If I choose a "Flying visit" this works out as £12.50 and gives me camping Sat Night and the Boater X Event. But if I choose "Individual Adult" it costs £25.00. Am I being stupid here - what does the extra £12.50 give me - access to Sat Day Stuff? I am not challenging prices, just wanted to see what options are available before I book.